When we Westerners think about the run up to World War II in the 1930s, we tend to focus on Hitler's rise to power in Europe. Japan's aggressions in China rarely, if ever, cross our minds, but there are as many heart-breaking and human stories from that brutal campaign as there are on the other side of the world. The Samurai's Garden follows a young Chinese man, Stephen. Recovering from tuberculosis, he is sent to his family's summer home in the small town of Tarumi, Japan, where the property's caretaker, Matsu, becomes his caretaker, friend, and father figure. His mother, sister, and schoolmates stay behind in Hong Kong, while his father continues working in Tokyo. As Stephen recuperates, he spends his time resting, swimming, painting, and getting to know the village inhabitants. Slowly he notices that he is the only young man around, all the others having been conscripted into the Japanese army. The war is an incessant backdrop for the novel and he and Matsu listen to the radio reports of Japanese victories and read the day-old newspapers Stephen's father sends down from Tokyo documenting the Japanese army's inexorable march closer and closer to his family's home. The tension of the war is a constant contrast to the freedom Stephen feels as he heals and learns. Stephen learns difficult truths about his family while he's in Tarumi. Wrestling with the knowledge that his father is not the person he thought he was, Stephen leans on the quiet integrity and solidity of Matsu. Matsu takes him to visit a leper colony on a nearby mountain and Stephen meets Sachi, the woman Matsu saved from despair when she became ill and was rejected by her family for bringing shame upon them. Sachi becomes an important influence on Stephen as well, teaching him from her life experiences and example. 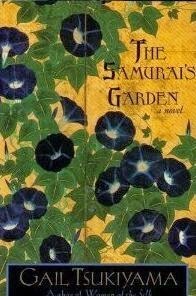 The Samurai's Garden is a moving story of growth and healing, love and loss, fear and bravery, humility and beauty. The language is almost achingly beautiful at times and the Japanese and Chinese cultures are explained so subtly and effectively. This is an author I'd like to read more from.